There are two distinct Lumsden families on our family tree. Great Grandmother, Mary Ann Lumsden, was the eldest of three children born to John and Susannah Lumsden. Born in Blyth, Northumberland, in 1856, she married John Parker from Lowestoft. 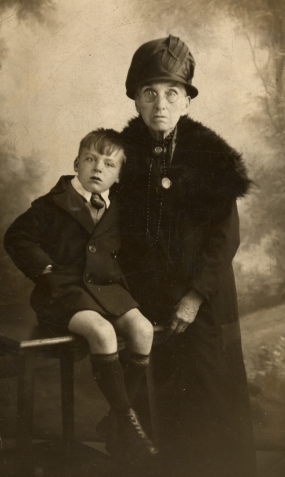 Here, she is seen with her grandson, Piercy Parker. 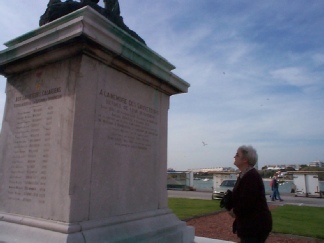 Mary Ann told her grandchildren a tale of having lost her father, a sailor, when she was very young and of how he had died in France. 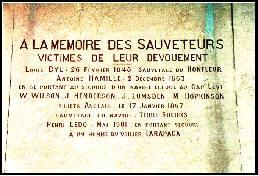 After extensive searches through newspapers and French Civil Registration documents, the story was proved to be true. Whilst attempting to rescue French sailors, whose boat was sinking in gale force winds just off the coast of Calais, John Lumsden, mate of the brig William of Blyth, was one of those killed. According to newspaper reports, the French lifeboat men were reluctant to go out, but the British sailors took their boat and attempted a rescue. The second Lumsden line features Frances Lumsden who was reputedly born in Lowick, Northumberland, around 1810. She married John Ogle - one of the border marriages we have at last managed to trace.